Congratulations and I hope you enjoy the beautiful candle as much as I do. 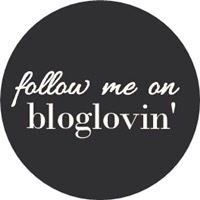 Make sure to check out her beautiful blog and find her on twitter! It’s my day off work today and I can’t wait to just relax with a cup of tea whilst catching up reading all of your blog posts! 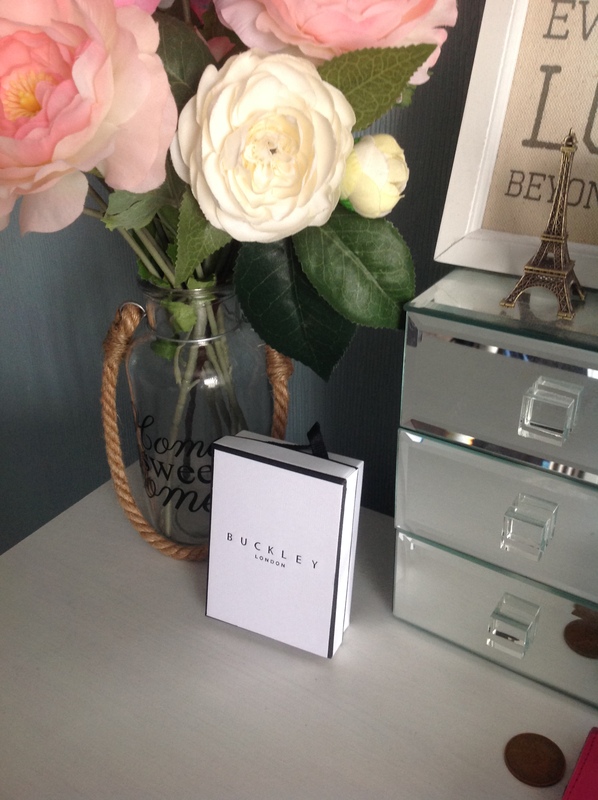 I came home from work a couple of days ago to a lovely package from Buckley London. 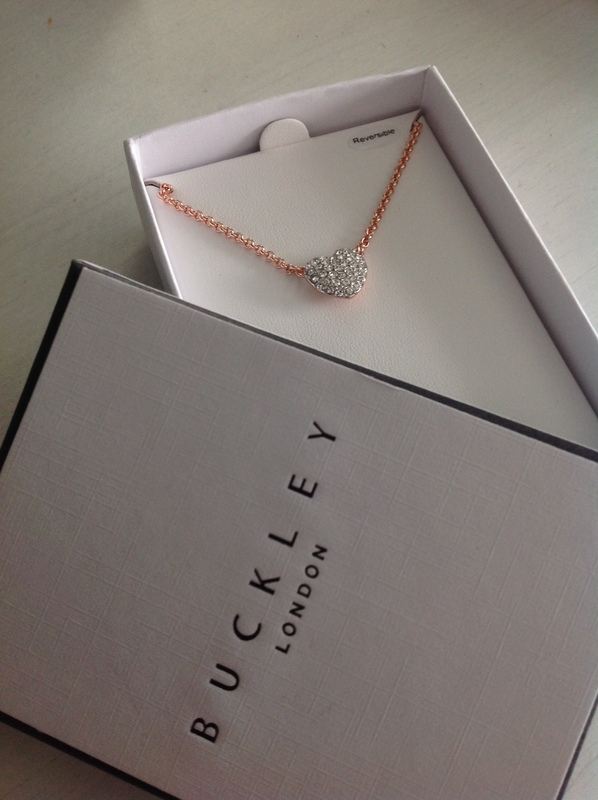 I took part in the #BHtwitter party and was lucky enough to be gifted by the beautiful Buckley London Jewellers. What girl doesn’t love jewellery.. right? 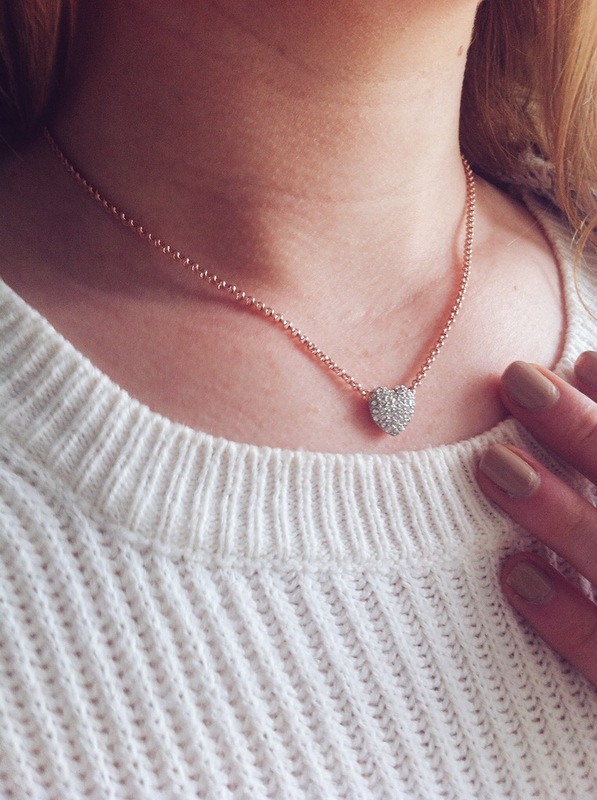 The piece I was sent was a gorgeous heart pendant necklace in a rose gold colour with clear Austrian crystals. – It’s PERFECT! The packaging is so elegant and simple. I have a small obsession with jewellery boxes and I have a great collection so far. When first opening the box, I was stunned at how gorgeous this necklace is. It is so feminine and I adore the rose gold colour and crystals. As you can see, the necklace is also reversible with a plain rose gold back. Either way, the necklace is absolutely beautiful. As you can see, its completely versatile and looks stunning for any occasion. It was date night last night, so I wore the pendant with a plain white jumper, jeans and heels. As it is so dainty it just adds a subtle hint of sparkle to any outfit. I cannot wait to explore the Buckley London website to find more gorgeous pieces. Not only is the jewellery flawless, they are so well priced!…. It is payday coming up so I wonder what I will be buying…. I would love to pair this necklace with the matching Miniature Heart stud earrings, they are equally as pretty and surrounded in sparkle. I couldn’t be more thrilled with my new favourite necklace, it’s already becoming part of my everyday outfit! They also have a twitter! Fancy joining me at the next Bloggershub Twitter party? 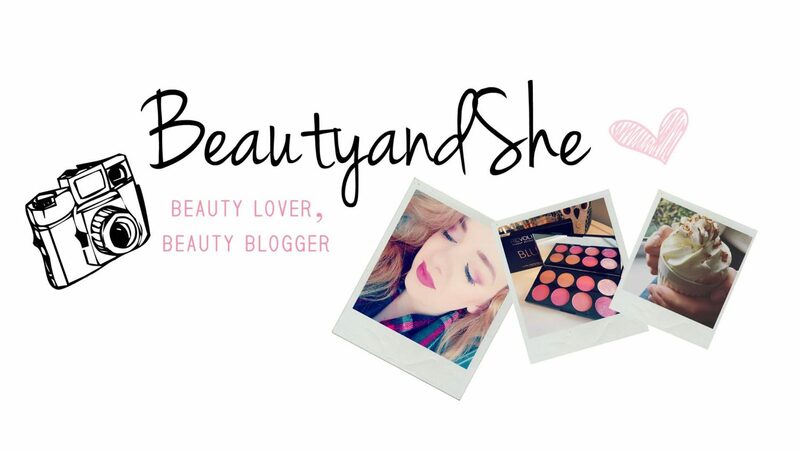 Sign up to The Bloggers Hub where there is great inspiration and gorgeous brands to find! So what are your favourite pieces of jewellery to wear? Let me know in the comments below! Speak to you beauties later! The most beautiful Jewellery by RasaVilJewellery! Its a cold and rainy day here in Wales.. and what better to do on a rainy day than to browse on fashion websites with a hot cup of tea and a slice of cake! I love ETSY and I think the shops on there are truly inspirational! I came across a beautiful little shop run by Rasa Vilcinskaite – RasaVilJewellery. The great thing about ETSY is that new and upcoming designers can promote their business and their products to such a wide audience! Ive seen so many of her creations that I absolutely love and they are all handmade… She has had her work featured in the Artistar Jewels Exhibition in Milan amongst so many other talented artists and designers. What an achievement! Oh my goodness, This necklace is phenomenal. 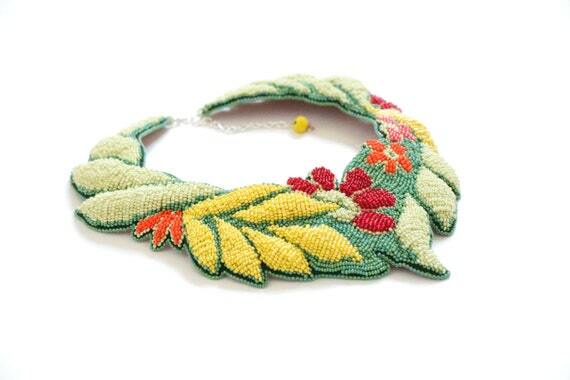 The level of detail on this large statement necklace is so beautiful and I cannot believe it was all handmade. The time and effort that must of gone in to this piece is unbelievable! I love the blue accents throughout the piece and the gorgeous shaping that makes it look so elegant. This necklace would be perfect with a simple outfit so the necklace is the main focus. This piece just screams spring! I dont know why but it reminds me of a harvest with all the different fruits flowers and vegetables! This piece is so colourful and its just a real happy statement necklace! It would be perfect with a fitted white T-shirt, High-waisted jeans and brown ankle boots. Simple and elegant. 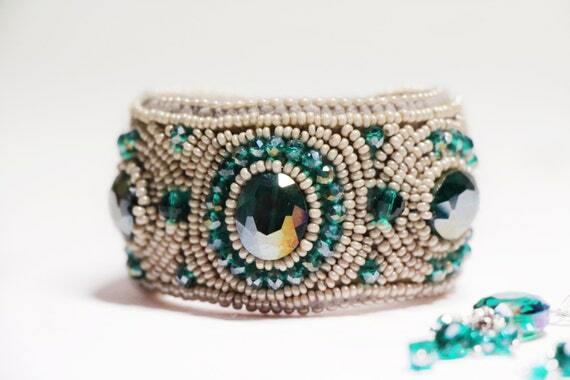 Sea blue crystals and white pearl beads, A match made in heaven. This is my favourite piece. It would be perfect for summer, dressed up or down. The large crystals in the middle are beautiful and reflect off all the other different colours. Rawrrrr! (Leopard impression)… For those of you who are fierce, this necklace is perfect for you! Its beading is in a leopard print style with true african colours, yellows, creams, reds and blacks. This would look amazing with a little black dress, smokey eyes and your favourite pair of heels! About Rasa and her Jewellery! “I always felt a passion for the arts. Since a young age I was writing poems, drawing. Being a pupil I attended additional art school. Goes to the next town to finish high school also joined the art school and i finish it. Now I’m a contemporary artist and have painter diploma. I decided to continue my study in master degree. But a little bit early, quite suddenly and unexpectedly, my best friend introduced me to the world of jewelry. I would have never thought of that, I’ll do it, and yet with such a passion. My jewelry career began with soutache technique, just recently, I fell in love beads and embroidery ornaments from them. They became my favorite. Yet. Because I am a Gemini by horoscope as many things as jewelry and I am fickle. Still looking for innovation, and I try to learn as much as possible”. I have never seen such colourful and more detailed jewellery. It is so unique and so different to anything I have seen before. Rasa is an amazing and talented designer that I will DEFINITELY be keeping up to date with . She is so inspirational turning her dream into reality. Keep posted for my daily doses of beauty!